What Version Of Windows Is Windows 7? The Humble Second Derives Its Name From What Source? 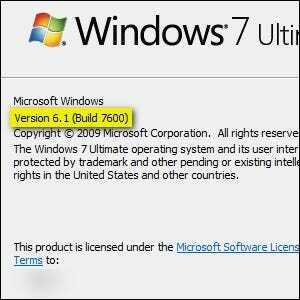 At first glance, the obvious answer to “What version of Windows is Windows 7?” would be version 7.0. Except that the name of Windows 7 has absolutely nothing to do with the version number and was selected as a marketing technique. What then is the real version number of Windows 7? If you’re on a Windows machine right now—Windows 7 or otherwise—you can pull up the start menu and type “winver” to check the Windows version number. If you’re using a Windows 7 system, you’ll find that the version number is 6.1, which is incrementally higher than the version number of Windows Vista (6.0). Running Windows 8? It’ll say Version 6.2. Running Windows 8.1? It’ll say Version 6.3. Windows 10? You’ll get a four-digit number that definitely doesn’t look like ten-dot-anything. We’ll get to that in a moment. So what’s the deal with such a tiny change in version number between two major operating system releases? The primary reason is to increase compatibility between applications that reference the major Windows version number for compatibility checks. In this same fashion, Windows XP and Windows 2000 are both 5.X releases to ensure cross-compatibility. By that same token, to increase compatibility with Windows 7, Windows 8’s version number was only incrementally pushed up to 6.2. With the release of Windows 10, however, Microsoft opted to jump the version number up to match the actual name of the product, both for simplicity’s sake and because checking the version number for compatibility isn’t as important today. Ironically, despite the official version number of Windows 10 being 10.0, if you run the “winver” command on a Windows 10 system, it will return a build version like “1507”, which doesn’t look a whole lot like the simple 10.X format you’d expect. That’s because so far, all versions of Windows 10 have been Version 10.0.XXXX, and the number displayed to you is only the XXXX part. Thanks for always keeping us on our toes, Microsoft.